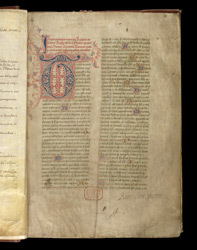 The first page begins the prologue of Thomas of Elmham's 'Chronicle of the Noble English Kings', as stated by the inscription at the top. Elmham, who compiled the 'Chronicle' in 1416 ("fourth year of Henry V", in the inscription), became prior of Holy Trinity, Lenton, after leaving St Augustine's, Canterbury, a few years earlier. It told the stories of the kings of Britain from Brut (the first king, who came from Brittany) through the Anglo-Saxons and Conquest to "the present day". This chronological spread would have emphasised St Alban's status as Britain's first martyr (better than St Augustine or St Cuthbert could claim) and the ancient beginnings of its abbey. At the bottom of the page, the 17th-century owner, Sir Robert Cotton, has inscribed his name.